Squidgydoodle. You may recall that I introduced you to Debbie at Squidgydoodle last autumn when we tested out her lovely Winter Wonderland box. We were so impressed, Munch even took his finished creation to bed with him! 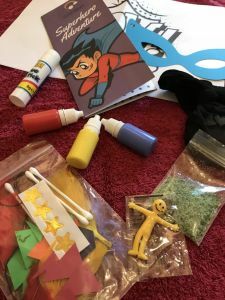 So when Debbie asked if we would like to try out her Squidgydoodle Superhero Adventure box we jumped at the chance. There are two things that really appeal to me as a parent with these boxes. The first is that the box itself can fit through the letterbox. I know that might sound peculiar but having three young children the idea of a trip out to the post office to collect a parcel makes me feel tired, and that’s before we’ve even put our shoes on! To know that you can order one of these craft boxes and it will arrive on your doormat is wonderful. The second, more important, aspect that appeals to me is that everything is there. 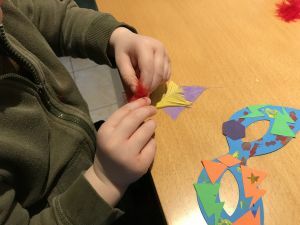 You don’t get wonderful instructions of craft ideas to make, with a few bits and pieces then a long list of “all you need is an egg, 3 tablespoons of flour, 2 wooden sticks, an acorn and a cricket bat”. No. All we needed for this was somewhere to create, a cup of water and our imaginations. Simple. I also used a plant saucer to put small amounts of the paint in, but that’s through experience of what works with my three enthusiastic boys, rather than a requirement that everyone would need. So, on to this Superhero Adventure box. 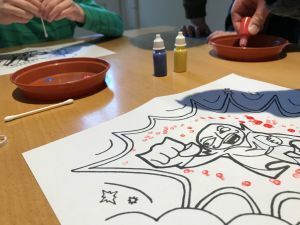 As with the Winter Wonderland kit there were plenty of suggested activities whilst also leaving room for individual imagination. Squidgydoodle boxes are aimed at children aged 3 to 8 years old. 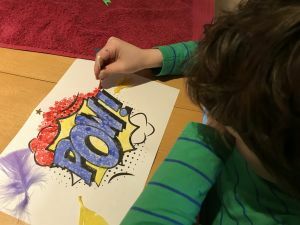 I personally think that this one might suit the slightly older children in this age range (The Loud One being 3 loved making a mask, but couldn’t quite grasp the concept of dotting the paint on the “POW!” picture, for example). We got started with the painting. 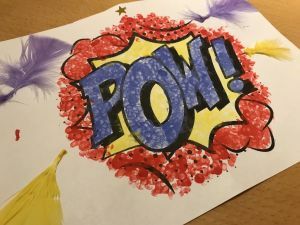 Chief took charge on the “POW!” picture, Munch wanted to splat the baddie but chose to paint him with the cotton buds first then hit him afterwards with the rice filled stocking (!) 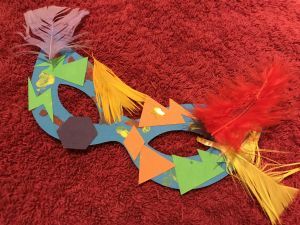 and The Loud One created a superhero mask. 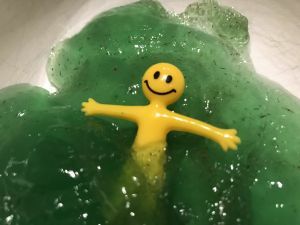 Whilst they were occupied with that, the slime was busy ‘cooking’ in the microwave ready to play with later. Everything was a hit and once more all three of my boys were engaged and very proud of what they had produced. Not only that but they had loads of fun too! 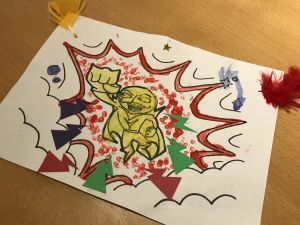 In fact so much fun that lunchtime was delayed in order for them to finish their creations – almost unheard of in our house with three growing children! The price for this box is £12 which seems very reasonable. 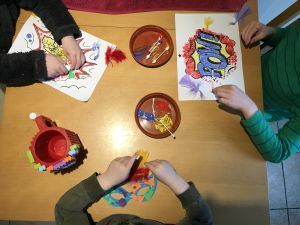 Split three ways (either between children or split into separate sessions) that’s £4 for a good half an hour (or more) of fun and engaged activity. Plus of course they get to keep what they’ve made, and we get a little leftover paint and glue for other craft creations. I would recommend this box to others. Squidgydoodle makes these for parties too and I imagine that they are a real hit there as well! Don’t just take my word for it though. 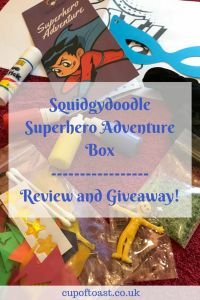 I have teamed up with Squidgydoodle to give one lucky reader a FREE Superhero Adventure box! All you have to do to be in with a chance (or chances!) of winning is enter below. Terms and conditions are on the link, please take a moment to read them. Good luck! N.B. I was gifted this box in exchange for this review. All thoughts are my own! To learn more, please see my disclosure page. This looks right up our street!! I love the idea of this box. I’ll have to recommend it to my cousin as she’s always looking for activities for the kids. It must’ve have been good if lunchtime couldn’t entice them to finish on time! Thanks for sharing! Haha, yes indeed. I don’t think lunchtime has ever been delayed for something like this before!! Yes. Totally engaged my boys and was lovely to watch them creating together too! I know exactly what you mean about the craft “sets” that then expect you to have a load of random things lying about the house! This sounds great! Yes, that can be so annoying can’t it? All here in this kit, it’s brilliant! The mask is great fun!